In our time of so many distractions and worries, it is easy for forget why Christ was born, why He came among us a helpless baby in a cave used for a barn with an animal’s feeding trough for His crib. As St. Paul wrote in today’s epistle lesson, He appears so that we may appear with Him in glory. Both the first coming of His birth and the second coming of His return are so that we may share in His salvation. But to encounter Christ at either of His appearances is also to undergo a kind of judgment, for the truth about ourselves becomes evident when we enter into His presence. How we respond to Him reflects the state of our souls. The same is true of how we prepare to receive Him during this blessed season of Advent, of the Nativity Fast. Throughout the history of the Old Testament, there were those who ignored both the Law and the Prophets, who did not prepare and were not ready for the coming of the Messiah. That was also true at the time of the Savior’s birth when the wicked Herod tried to kill Him. On this Sunday of the Holy Forefathers, we commemorate those who did prepare, all those in the Old Testament who foretold or prefigured the coming of Christ. The first coming of our Lord at His Incarnation did not simply occur one day as a random event, but was the fulfillment of God’s plan to bring us into His divine life, which took many generations to fulfill. No one was forced to get ready for Him, and today we honor those who accepted the invitation to prepare for the coming of the Messiah. We want to use this season of prayer, fasting, almsgiving, and reconciliation to become more like them. That is difficult because we constantly face temptations to focus on other things. Like the guests invited to the great feast in today’s gospel, we often think that we have more appealing things to do. They turned down the invitation because they had land to inspect, oxen to test, or family responsibilities. In other words, they were normal human beings with everyday obligations. So their places at the banquet were taken by the most unlikely guests: the poor, the maimed, the blind, and the lame. Strangers from the highways and hedges came to the celebration, but none of those who were originally invited bothered to show up. The Lord often used the image of a great feast for the Kingdom of God and this parable reminds us that many of the Jews were not prepared to accept Him as the Messiah, while many disreputable people—such as tax collectors and others of low standing, even Gentiles—did receive Him. Whether they did so or not judged them in a sense, for it revealed the state of their souls. Unfortunately, we often act like those who refused to attend the great banquet in the parable because we use the common concerns of life as excuses not to appear with the Lord in glory, not to participate in the healing and blessing that He comes to give to all those created in His image and likeness. Instead, of making everything from our daily work and family relationships to our health or sickness opportunities to find greater healing for our souls, we so often make them false gods in ways that judge us, that make clear the weak state of our spiritual lives. That is how we shut ourselves out of the great banquet and turn away from the glory that is ours in Christ Jesus. St. Paul told the Colossians to prepare to encounter Christ by putting their sins to death, for they are all forms of idolatry that exclude us from the holy joy of the Kingdom. Everything from anger and slander to sexual immorality and covetousness are symptoms of the “old nature” that He came to heal as the Second Adam. The weeks of Advent call us to prepare intentionally to welcome the Savior at His birth, for if we do not we risk being so distracted and weakened by our sins that we will have as little interest in being in His presence as did those guests originally invited to the banquet. It is very easy to fall prey to such temptations because there is much in us that does not want the truth about our souls to be revealed by encountering Christ. Unlike the guests in the parable, we should know that the cares of life in no way hide the state of our souls from God. The more we make false gods out of other people, our daily responsibilities, and whatever life circumstances we happen to face, the more that we turn away from the salvation that Christ was born to bring. The more we embrace pride, anger, lust, greed, and other temptations, the more we will actually believe that satisfying our desires is more important than loving and serving God and neighbor. We do not have to appear spectacularly sinful before others in order for this to happen, as there is much in our culture that encourages us to worship our work, our problems, our pastimes, and whatever gives us momentary pleasure. It is so easy and alluring to become like the people in today’s parable who really believed that they had better things to do than to share in the great joy of the Lord’s banquet. But to live that way is to shut ourselves out of the glory that Christ came to share with all He created in His image and likeness. It is to sentence ourselves to misery and decay that are not fitting for those who dare to call God their Father. Christmas, of course, is a banquet, a great feast. It is a celebration of our salvation in the God-Man Jesus Christ, Who in Himself united humanity with divinity, Who brings us from mortality to immortality. 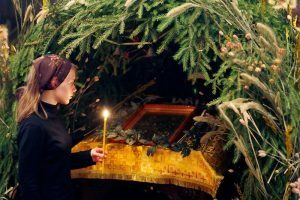 No matter whether we have observed the Nativity Fast so far, we all have the ability to use the next several days to prepare to enter more fully into the great glory of our salvation. Our preparation is not about legalism, but about opening ourselves to the healing mercy of Christ as we prepare to encounter Him at His birth. For how we receive Him will reveal the true state of our souls. Because we all weaken ourselves by sinning, we all need to confess our sins and repent in the Sacrament of Confession. Because we encounter the Lord in our suffering neighbors, we all need to give generously of our resources, time, and attention to those in various kinds of need. Because we are all enslaved to self-centered desires in one way or another, we all need to fast or practice self-denial in a way appropriate to our strength and life circumstances. Because we are all shaped by what we give our attention to, we all need to focus our hearts, souls, and minds on God—deliberately and regularly– in prayer. Because we are all so easily distracted, we all need to be mindful, keeping a close watch over our words, thoughts, and deeds. During these weeks of Advent, we may accept the invitation to the great banquet of the Lord by embracing these spiritual disciplines. As difficult as we probably find them to be and as bad as we are in doing them, they are powerful means of opening our souls to the glory that He has brought to the world through His appearance at Bethlehem. They are how we humble ourselves before Him, fighting our passions, resisting our temptations, and doing what we can to prepare to welcome Him at Christmas for our salvation. They are what Advent is all about. Christmas will be here soon, and how we respond to the Lord as His birth will make clear the state of our souls. 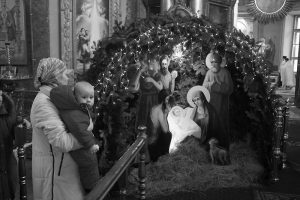 Will we be ready to welcome Christ into our lives at His birth? Will we be ready to accept the invitation to the feast? I certainly hope so, for the good news of Christmas is that in our Lord the fulfillment of all God’s promises is extended to people like us, those poor, blind, and lame with sin, who suffer from the pain, weakness, and corruption of life in the world as we know it, and who are nowhere near perfect. The good news is that, in the Babe of Bethlehem, even unlikely people like you and me are invited to take our place with the Holy Forefathers and Foremothers of Christ in the heavenly banquet and to shine with the light of heaven, to appear with Him in glory. That is why our Savior was born.